If you’re planning to go hiking this summer, you may not be planning to go alone. After all, who would enjoy a nice hike through the woods more than your furry friend? A lot of dog owners like to bring their dogs on hiking trips. It gives their furry family members a chance to get back to nature and smell different smells. While hiking can be fun, you will also need to be mindful of keeping them safe during your trek. 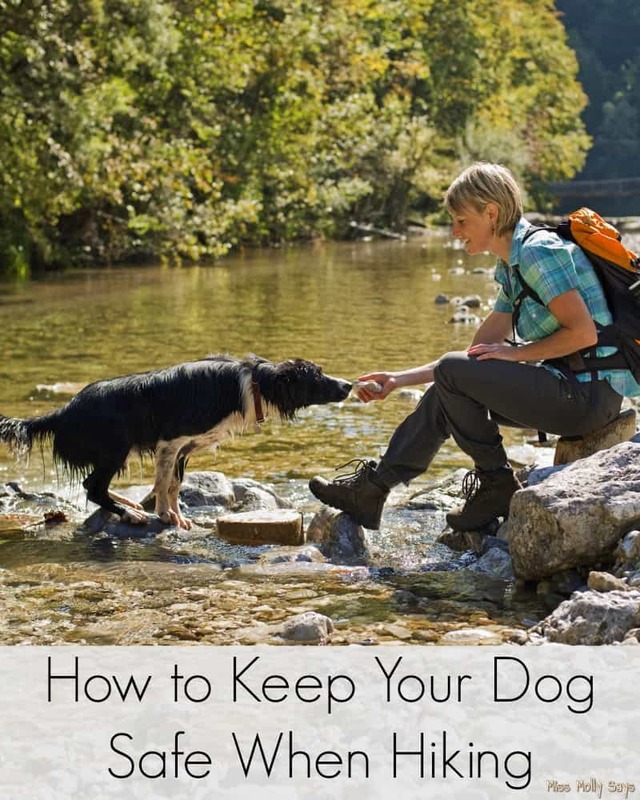 To help you out, here are some tips on How to Keep Your Dog Safe When Hiking! First and foremost, before your dog ever sets a paw in the woods you need to ensure they’re up to date on their preventatives and vaccinations. That means making sure they’ve had their monthly flea, tick, and heartworm preventative medication. It also means ensuring that along with their rabies vaccination that they’ve also had their DHLPP vaccination and bordetella (kennel cough) vaccine. And just in case a tick does get on your dog, bring some tweezers along so you can pull it off right away. While you may dream of hiking through the woods with your loyal dog free at your side, obeying your every command, the truth is that dogs are curious, impulsive creatures. Even a very well-trained dog may dash off after a rabbit. And a dog deep into sniffing may not pay enough attention to stop before falling over a ledge! To keep your dog safe when hiking, always keep them on a leash, whether you’re actively hiking or having a rest. Also, make sure that your dog wears their collar with all their identification tags. Pethub is a great place for pet identification tags! They have a large variety of pet id tags which are cell phone scannable. In addition, they offer an online resource to help find your pets if they get lost. As an precaution in case your dog runs away and loses their collar, it would be best to get them microchipped as well. You could even get them a GPS collar as extra protection! Call me paranoid, but when it comes to my pet’s safety it is perfectly fine with me! Not all dogs like water. And even those who enjoy swimming could easily find themselves overtaken by a strong current. So if you’re planning on hiking through a river, make sure your dog can handle it, or prepare yourself to carry them across. Also, while you won’t be able to completely stop your dog from drinking lake or river water, do your very best to discourage it. You don’t know what diseases may be floating in it (like giardia). It is much safer for your dog to drink water you brought or filtered on the trail. If you’re trying to hike with a Bulldog, don’t expect them to go as far or as fast as a Labrador. And even a young, long-legged dog won’t be able to go very far if they’re not used to long, hot walks. Before you go hiking, try to build up your dog’s stamina by taking them on longer and longer walks. And to keep your dog safe when hiking, keep an eye on them to ensure they don’t get overheated, over-tired, or hurt their paws. Take plenty of breaks, and make sure your dog drinks water during those breaks. There’s a lot more than just bunnies and mice out in the grass and brush of a forest. There are also poisonous spiders, scorpions, and snakes, along with porcupines, skunks and other small, troublesome animals! To keep your dog safe when hiking, keep them from poking around in the grass and bushes. You might not like what they find! Have you ever gone hiking with a dog? great tips! sharing with my crew. There have been too many cases of dogs getting caught in traps (often illegal) that were set by hunters to catch wild prey. These traps are barbaric and too many pets have died in them. Be especially careful when the grass or brush is deep enough to conceal a trap. I agree!!! Great information! Thank you!